Spend a Day in the Antarctic with an Adélie Penguin Chick! In the first part of the One Day on our Blue Planet series, we explored the grassy plains of the Savannah with a little lion cub. This time, the temperature turns a lot cooler as we follow an Adélie penguin chick throughout her day in the Antarctic. 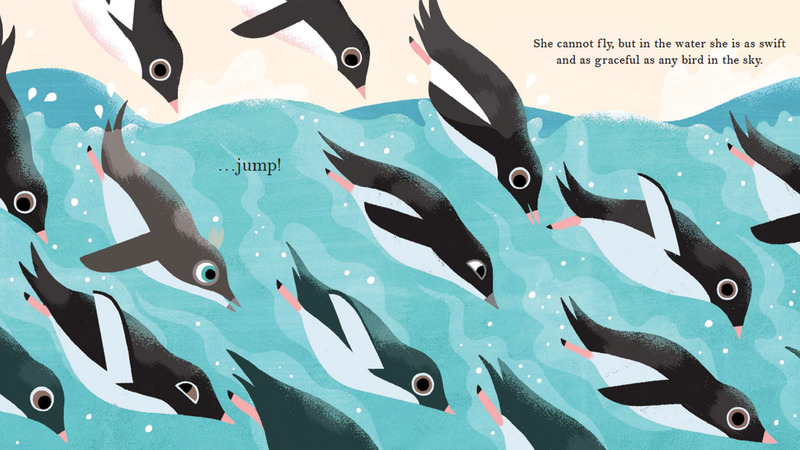 Meet all kinds of penguins and other feathered friends as she waddles along the frozen coast and dive deep beneath the ice to find krill, fish and squid to eat… but watch out she doesn’t become food herself! 1.It goes without saying that the Savannah and Antarctic landscapes are very different, but how did you go about showing this in the books? The most striking (albeit obvious) difference that comes to mind is the climate! One is very hot, and the other extremely cold, and I ended up using very different colour palettes for each book in order to help convey these two extremes. Other than that, there was the obvious difference in the amount of foliage – that is, in Antarctica there really isn’t any. In fact, Antarctica is a far more barren landscape in general, so I had to find other ways of adding visual interest to the backgrounds. 2. And were there any surprising similarities? Both areas seem to have a similar sense of vastness about them. In both the Savannah and Antarctica everything seems to be very large and spaced out, including the animals, so at times I had to sort of compress things a little bit so they would fit within the confines of a double-page spread! 3. How did you reference One Day on our Blue Planet- without travelling to the Antarctic, did you go to zoos or watch nature documentaries? I did visit a zoo – unfortunately they didn’t have any whales, although I did see a few penguins! They weren’t the right species, but they were still very cute. I mostly watched some nature documentaries and clips, and used google images alongside certain websites. Some of the more obscure animals (I’m looking at you, Arnoux’s beaked whale!) were particularly difficult to find references of, although I suppose that is understandable considering where they like to live! 4. The books are non-fiction but you wouldn’t necessarily know it! What were the challenges in storytelling factual information to a young audience? The main challenge for me was integrating the facts into the storytelling in a natural way, that didn’t feel too overwhelming, dry, or heavy-handed. I think we actually managed to do this by keeping the text itself to a minimum, and following the classic mantra of ‘show, don’t tell’! I also enjoy using the endpapers of the books as an extra, fun way of delivering information outside of the main story itself. 5. Which creators are you most influenced by? Both legendary illustrators and fresh new talent. There are so many! Mary Blair is one of my all-time favourites, alongside Miroslav Sasek, Alain Gree and Charley Harper. 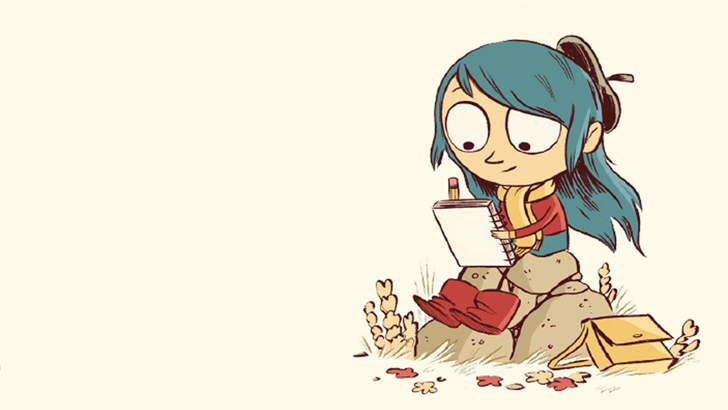 For more contemporary illustrators, I am a big fan of Meg Hunt and Isabelle Arsenault, Marc Boutavant, Icinori, Kenard Pak… Those are just a few, I could go on for a very long time! 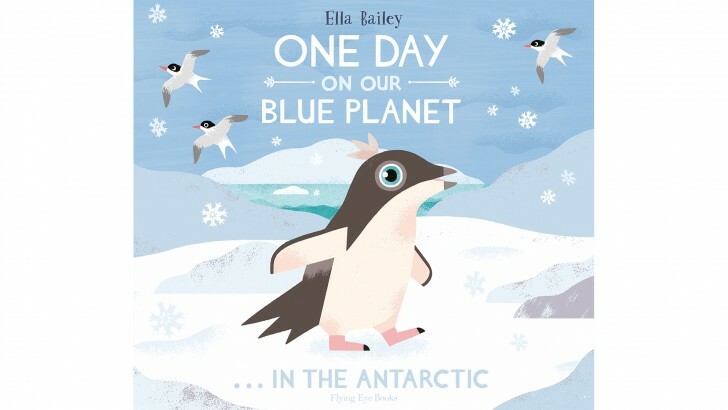 Take this little penguin home and grab your copy here! An Important Webshop Holiday Announcement! Please note the final day for US AND INTERNATIONAL ORDERS to be dispatched and received before Christmas is Monday, 14th December. The final days for UK ORDERS is Friday, 18th December. The webshop will be closed from Tuesday, 22nd December to Monday, 4th January so any orders received during this time will not be dispatched until 4 Jan onwards.